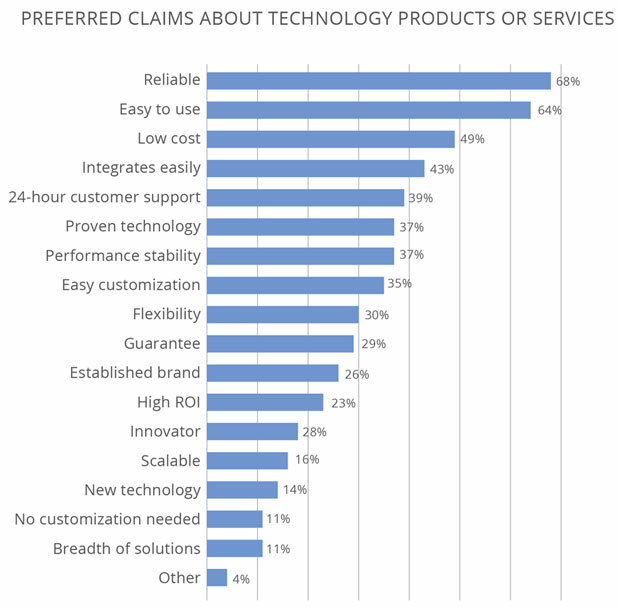 Product reliability and ease of use are key for business-to-business technology marketers, according to a recent survey of technology product and service decision makers throughout the United States, the E-Commerce Times reports. Four hundred B2B tech buyers participated in the survey, conducted for Lavidge by WestGroup Research. Overall, 68 percent cited reliability as the most critical criterion in their purchase decisions; 64 percent said ease of use was key. Among preferred marketing tactics, 40 percent of the decision makers ranked meeting marketers in person during the consideration phase of the purchase as their top preference. About 36 percent preferred recommendations of colleagues and friends, while 35 percent gave first preference to pricing. only 4 percent responded positively to telemarketing and cold calls. The report considers B2B email marketing and social media message blasts where recipients aren&apos;t prequalified with a reasonable expectation of receiving the message as cold calls. "Getting to decision makers is crazy difficult in today&apos;s fragmented environment, which is why an omnichannel approach is required," remarked Stephen Heitz, Lavidge&apos;s chief innovation officer. Face to face meetings in the final decision making phase were key for 49 percent of large enterprises but only 33 percent of smaller firms. "Typically this issue only affects a handful of technology companies that provide services to both the SMB and enterprise market," Heitz told the E-Commerce Times. Sales of less than $20,000 "do need a very different approach," he said. "We would advocate different approaches for larger and smaller customers," said Michael Jude, research manager at Stratecast/Frost & Sullivan. "That&apos;s the point of targeted marketing," he told the E-Commerce Times. Still, "multiple markets can be addressed and should be part of an overall marketing plan," Kathleen McEntee, president of Kathleen McEntee & Associates, told the E-Commerce Times. Increasing access to intelligent data will lead to better targeted emails, according to the Lavidge report. Companies offering services that access, analyze and repackage data at a highly personalized level will let anyone take advantage of AI, big data and advanced analytics to offer personalization. "AI is actually pretty inexpensive," Frost&apos;s Jude pointed out, "It&apos;s the big data component that&apos;s expensive. However, most of these capabilities are available through cloud services," which means smaller firms could use them. Companies can use various tactics to encourage referrals, including paying advocates, the report suggests. However, unless there&apos;s a value driver for a referral, "there is no value to a large firm to spend time advocating for a vendor," said Lisa Anderson, president of LMA Consulting Group. "A paid referral may not be looked upon favorably," she told the E-Commerce Times. Further, large firms have guidelines around vendor compensation and initiatives. Marketers could get around that problem with a properly constructed referral program, Frost&apos;s Jude suggested, or use VARs, "who typically deal in discounts." Still, "testimonials and personal relationships go a long way to assist marketers and sales people [in gaining] credibility with prospective clients," Anderson noted. Although poorly received, cold calls cost about 80 percent less than in-person visits and let firms reach customers who may not travel to their place of business, the report notes. Telemarketing and cold calls "are tried and true, so they&apos;re worth considering," Frost&apos;s Jude said. However, companies should use a decision model to assess the most effective approach. As for email marketing and social media blasts, "make such programs opt-in," advised Jude, "and provide an incentive to do so."